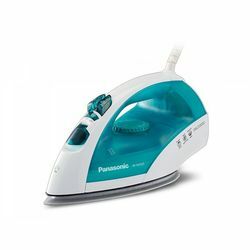 Panasonic Steam Iron NI-E410TMS is sure to remove all the creases of your clothes and make you look fresh. It is equipped with tank which has the capacity of 200 ml. The titan silver sole plate is robust and sturdy. It comes with 1 year warranty. Panasonic Steam Iron NI-E410TMS is sure to remove all the creases of your clothes and make you look fresh. It is equipped with tank which has the capacity of 200 ml. The titan silver sole plate is robust and sturdy.It comes with 1 year warranty.